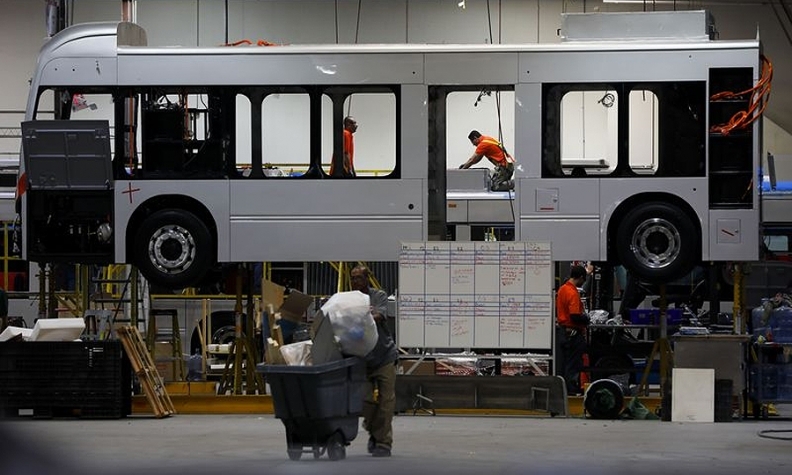 Employees manufacture electric vehicles at the BYD Coach and Bus factory in Lancaster, Calif., last month. TORONTO -- BYD Co., the Chinese electric-vehicle maker backed by Warren Buffett, plans to open its first assembly plant in Canada, anticipating a surge in demand for electric trucks from municipalities and businesses. BYD will open the plant next year in Ontario and hire about 40 people to start, BYD Canada spokesman Ted Dowling said in a phone interview. The Shenzhen-based company has decided to “significantly” accelerate its investment in Canada as growing demand for electric vehicles and provincial tax incentives create a more welcoming environment than the U.S. in the short-term, he said. The company opened an electric-bus manufacturing plant in Lancaster, Calif., starting with less than 100 employees in 2013 and has boosted that to 700 workers. If successful, BYD could be at the forefront of rebuilding a dormant truck-manufacturing industry, Dowling said. Canada has been losing auto investment to cheaper locations in the U.S. and Mexico with one of the last major commercial truck assembly plants closing in Ontario in 2011. Ontario is still home to Canada’s auto industry with General Motors and Ford Motor Co. among companies with plants in the province.